suicide bullets: Japanese Kit Kat addiction - thanks rancor! I'm not much of a guy for sweets - especially chocolate. 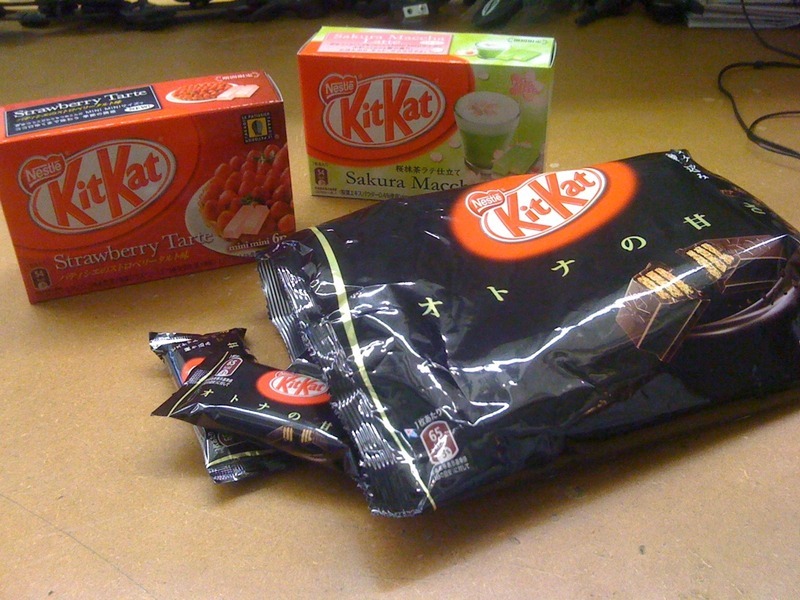 If I snack, its usually something salty, but after I bought a few things from rancor on the shmups forum from his site, Tokyo Shmups!, he sent in the box a couple green tea Kit Kats and I was immediately hooked. I bought these from Asian Grocer.com and they came lickity split. The dark chocolate ones beat the hell out of the ones we get here in the states and the other two flavors are just stellar as well. They are about half the size of American Kit Kats and its seems to be a perfect ratio for chocolate to wafer cracker. Plus, Strawberry Tart? You knew that was gonna be good even before I told you so. Check out rancor's site in the sidebar and get yourself some shmup goodness and get started on that Kit Kat addiction! Rancor did the same to me. Bought some doujin love and now crave more kit kat flavored goodness. Yes - its hard not to like them for sure. get your fix at Asian Grocer, or just order some more stuff from rancor! I swear, these are like crack.